The Great Food Blogger Cookie Swap raises money for Cookies for Kids’ Cancer with the help of sponsors Dixie Crystals, Land O’Lakes and OXO. The chance to be part of that campaign was a huge part of why I signed up to participate for the third year. Sweetening the deal, literally and figuratively, were the three dozen cookies I knew I would receive in the mail from other participating food bloggers. I received Candy Bar Cookies from Cydnee at Tampa Cake Girl, Toffee White Chocolate Chunk cookies from Alyssa at What’s Cooking, Love?, and Nutella Brownie Batter cookies from Nicole at For the Love of Food. I couldn’t choose a favorite; each kind of cookie was delicious, perfectly baked, and beautifully presented. You will have to join me in looking for the recipes when the round-up is posted for the Cookie Swap entries, because all three recipes are keepers! For my part, I was asked to chose a new-to-me recipe, one I had never blogged before, to bake and send to my three matches. At the time I was planning my selection, I was reading the Zahav cookbook, excitedly marking recipes to try and making notes of ingredients to buy in preparation. A page I returned to over and over had tehina shortbread cookies. At cookie swaps I hosted in the past, I was taken by some tahini (the spelling of tehina I am more used to, and will continue with) cookies made by my friend D. They appeared simple, but the flavor was so different from anything I had tried before, and they were perfect with a cup of tea. Years later, I remember how good those cookies tasted to me, and how curious it was that I had never thought to use tahini, an ingredient that’s a staple in my savory dishes, in a sweet way. Tahini is innately bitter, and though bitterness is often perceived as a negative in food, I am quite drawn to it: coffee, escarole, arugula, citrus peel, fenugreek and turnips come to mind as bitter ingredients I enjoy. Though I am not sure you will find me making escarole cookies anytime soon… the balance of tahini with butter and sugar is genius. I chose to add a twist to Solomonov’s base recipe to make it my own, and used blackberry and cherry-rhubarb-vanilla jams I made last summer to transform the shortbread into thumbprints. In my version, the well-balanced tahini shortbread is gussied up as an homage to another beloved cookie, the peanut butter and jelly thumbprint. I know that almond thumbprints with jam are also holiday favorites, and for a good reason. Another benefit to using tahini in place of peanut butter or almonds in your cookies: it is made from sesame seeds, so may be a wise replacement if you are gifting to friends who deal with nut allergies or sensitivity in their families. As for the jam, blackberry was chosen because it is my favorite jam to use in a peanut butter sandwich, cherry because I think of it when I think of fruit flavors that might be common in Israeli sweets. With that reasoning, apricot jam would also be delicious. Really, you could use any jam for the filling; strawberry or raspberry would have also worked nicely. If you have more holiday baking to do, consider these thumbprints a fun twist on classic holiday treats. Children can help scoop the batter onto the sheets or press the “thumbprint” with the end of a mixing spoon. Don’t make the mistake of relegating them to the holiday-only recipe file, as these are destined to be a year-round option when I need a batch of cookies for the break room at work, a quick hostess gift or casual gathering. I hope my matches enjoyed the tahini shortbread thumbprints I sent, and I look forward to participating in The Great Food Blogger Cookie Swap again next year! Watch for the cookie recipe round up from all participating bloggers in the next few days; I’ll post links on my Facebook page. Happy baking! In a large mixing bowl, cream together the butter and sugar well, for at least 3 mins. Add the tahini and mix until thoroughly incorporated. Sift together the dry ingredients and add to the wet ingredients, mixing just until combined. Cover the bowl and chill the dough for at least one hour before proceeding. The dough can be made several days in advance if desired. I also had excellent results freezing a batch of dough, taking it out to thaw in the refrigerator for about 8 hours, and then baking as usual. Preheat the oven to 350 degrees. Line a few cookie sheets with parchment paper, for optimal results. I like to use a 1 T. cookie scoop for these, but you can portion the same amount of dough and roll it into balls if that is easier. Space the dough balls about 2″ apart to allow for spreading, about 16-20 cookies per sheet. Bake for 12 mins. As soon as the cookies come out of the oven, use your thumb (if you’re quick! and not heat sensitive) or the rounded end of a silicone or wooden, etc. mixing spoon to press an indentation into each cookie. Cool for 10-15 mins. on the pan and then carefully remove the parchment paper to a cooling rack. Dollop a small amount of jam into each center indentation. I believe 1/4 tsp. to 1/2 tsp. was right, depending on the depth of your mark, but found it was much easier to eyeball the amount than measure. After filling your tahini thumbprints, cool them completely on the rack and then transfer to containers for storage. These cookies keep, tightly covered, at room temperature for about 5 days. I think they are better the day after than right out of the oven. Brown butter snickerdoodles with cardamom & orange. 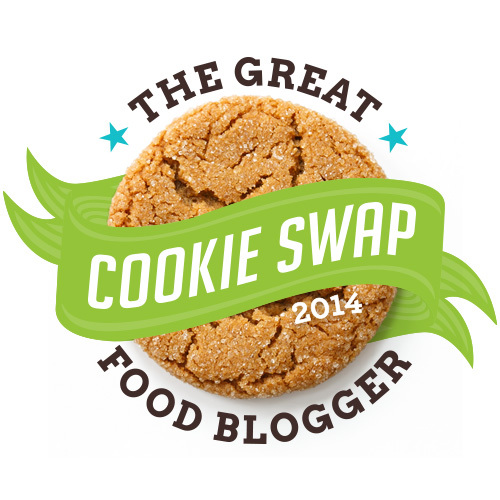 I was so excited to participate in the Great Food Blogger Cookie Swap this year! I missed the sign-up deadline last year and pouted more than once as I read about the creative, delicious cookies being shipped around the country. 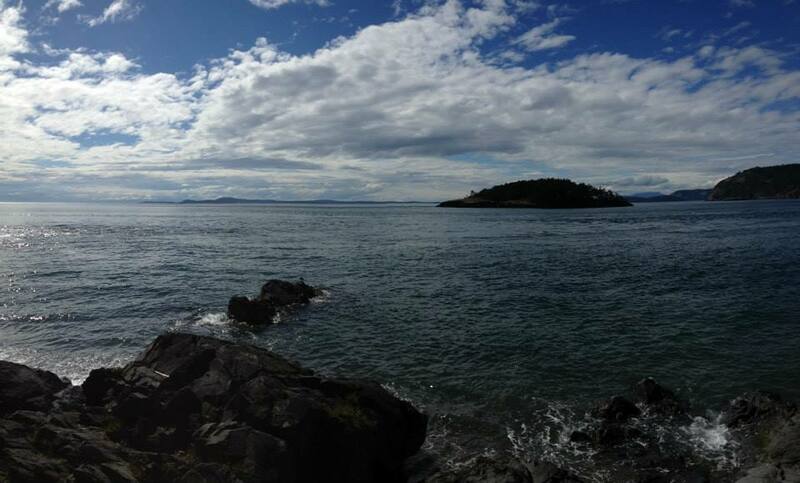 This year, I started looking for information in August, determined not to miss out. I swapped in 2012– here is the post about that exchange, with a recipe for stuffed cookies– and had so much fun. This year’s experience proved I was right to sign up again. The basic premise is this: anyone with a blog can sign up to participate in the exchange. In early November, the contest organizers from Love & Olive Oil and The Little Kitchen assigned each blogger three Secret Santa-style matches. After choosing a cookie recipe I had never written about before, I sent each of my three matches one dozen cookies. 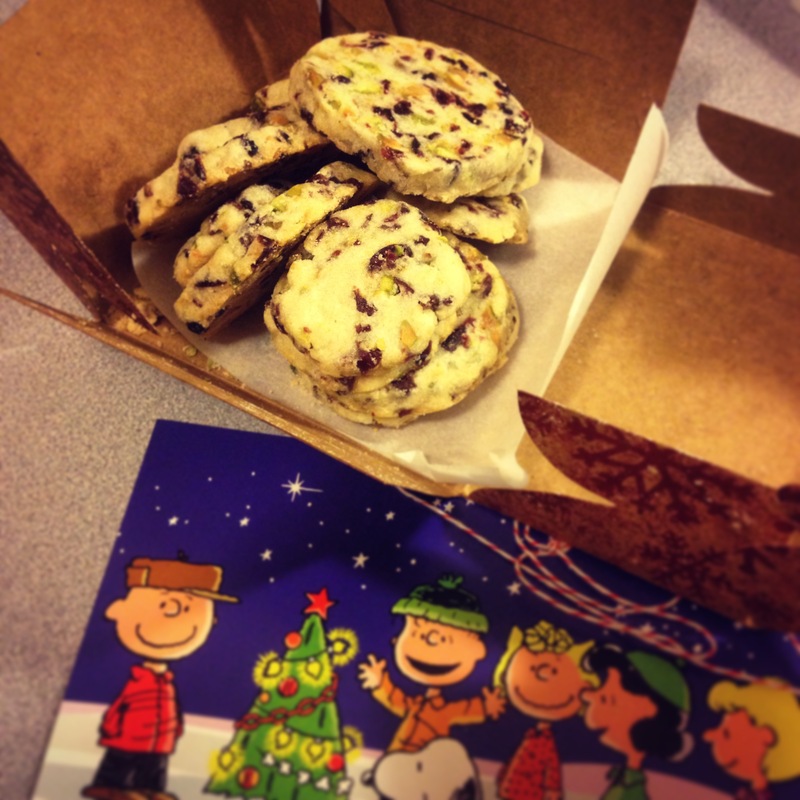 In return, I got three boxes of cookies, which I’ll tell you about now. The first box to arrive was from Nora, who writes at Cats and Commas. She made shortbread studded with pistachios and cranberries, which made me smile because that was my back-up recipe in case my snickerdoodles didn’t turn out! A quick look at her blog showed that we have a lot of similar interests in the kitchen. Thank you, Nora! I miss having shortbread to dunk in my coffee and can’t wait to see your recipe so I can try it myself. My second box came from Becca from Two Places at Once. Becca sent a lovely tin of spiced shortbread from Austin, TX; when I popped in to look at her blog, the first thing I saw was strawberry Dutch baby, which means I will be visiting again and often. The shortbread were so nice, not too sweet and perfectly crisp, another ideal cookie if you’re a dunker like me. Thank you, Becca! 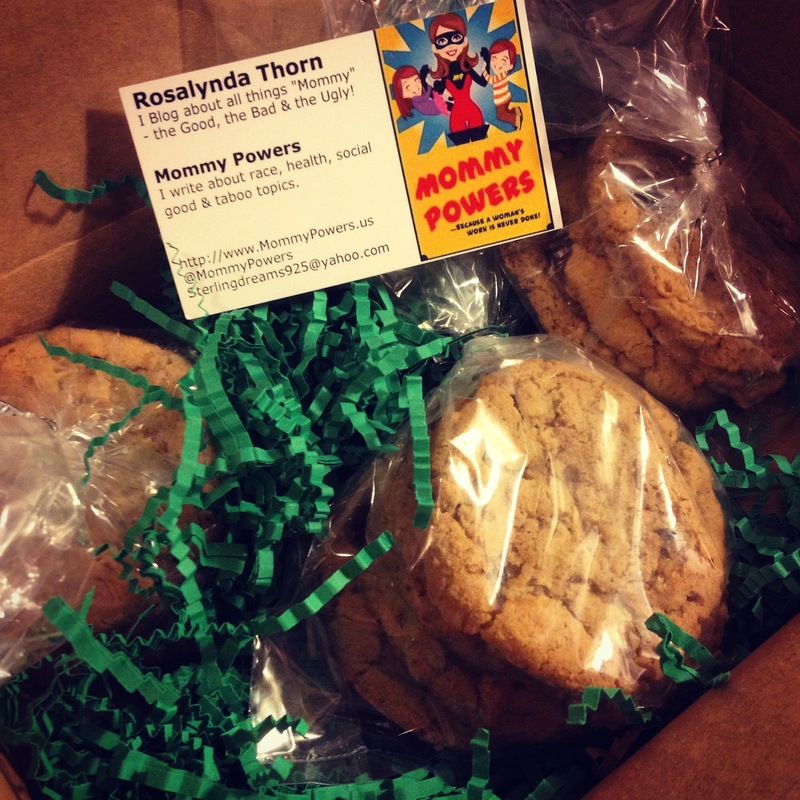 My third and final box came from Rosalynda, who writes both Mommy Powers and Sandy Gram. Rosalynda sent delicious raisin oatmeal walnut cookies, one of my favorites, from her home in northern CA. My husband said they’re the tastiest oatmeal cookies he’s ever had– thank you, Rosalynda! So, let me tell you what I made to send to Jamie at Love Bakes Good Cakes, Jennifer at The Rebel Chick and Marcie at Flavor the Moments. I turned, as I so often do, to the Baked books, Baked Elements this time, and made a variation of their incredible brown butter snickerdoodles. These cookies are perfection on their own; I’ve made them a handful of times and they are always a hit, always turn out well. I wanted to do something to put my stamp on their recipe, so I replaced some of the cinnamon with cardamom and added orange zest to the brown butter. I am so over-the-moon happy with this recipe! The whisper of orange flavor is just enough, and the cardamom reminds me of so many favorite Swedish baked goods; these feel like a cookie my Nana might have served at Christmas Eve decades ago. They are chewy, buttery and warmly spiced, just plain good. If you’re looking for a cookie to make for holiday gifts, these brown butter snickerdoodles package and ship like a dream. All of the participants of the Great Food Blogger Cookie Swap are sharing their recipes today– you can follow this link to see a partial round up of all the recipes submitted last year. 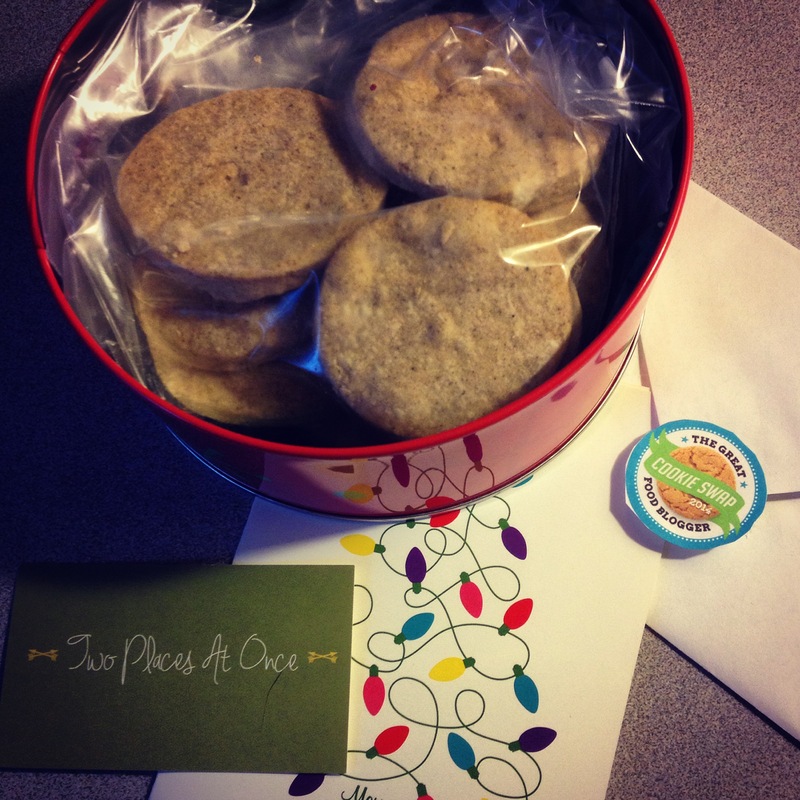 Check Love & Olive Oil or The Little Kitchen on Friday, December 19th for the cookies made and shared this month. Thank you to Lindsay and Julie for organizing such a fun event; I can’t imagine how much work it is to arrange, and we all appreciate that you do! A nod to sponsors OXO, Dixie Crystals, California Olive Ranch and Brownie Brittle, who match the bloggers’ donations to Cookies for Kids’ Cancer; this year, we raised a little more than $12,000. I already marked my calendar to participate again next year; if you’d like information about how you can be part of the fun, click here. There is nothing quite like a good cookie swap! In a large saucepan or skillet over medium heat, melt the butter. Continue cooking the butter, swirling the pan occasionally to discourage burning, until the butter turns golden brown. This takes about 8-10 mins. depending on your stove and the pan you’re using. Don’t walk away– it goes from bubbling melted butter to perfectly brown to burnt in the blink of an eye. Remove the pan promptly from the stove and pour the brown butter into the bowl of a stand mixer. (You can strain out the butter solids, but I really like the flavor they give the cookies, so I leave them in.) Add the orange zest and run the mixer on low speed for about 5 mins. to cool the brown butter; I use this time to gather my other ingredients. Sift together the flour, cream of tartar, baking soda, 1/2 tsp. cinnamon, 1/2 tsp. cardamom and salt. In a small bowl, beat the eggs lightly and add the milk. After the butter has been in the mixer for 5 mins. or so, add 1 c. sugar and brown sugar and mix until combined. Add the egg mixture and mix on medium speed until thoroughly combined. Add the flour mixture in three batches, scraping the sides of the bowl between each addition. Stop mixing as soon as you can’t see any dry flour and scrape the sides again to make sure no dry ingredients are pocketed near the bottom. Cover the bowl and refrigerate your dough for at least one hour (up to 24 hours)– don’t skip this step. When you are ready to bake, preheat the oven to 400 degrees and line three baking sheets with parchment paper. Mix together the remaining 3 T. sugar, 1 T. cinnamon and 1 tsp. cardamom; I find a pie plate or shallow bowl works well for rolling the cookies in the coating mixture. Use a medium-sized scoop to make golf ball-sized cookies. Smooth them by hand and roll each in the coating mixture until completely covered. Press down to very slightly flatten the top of each cookie as you place it on your cookie sheets. Leave space in between; I place 10-12 cookies per sheet. 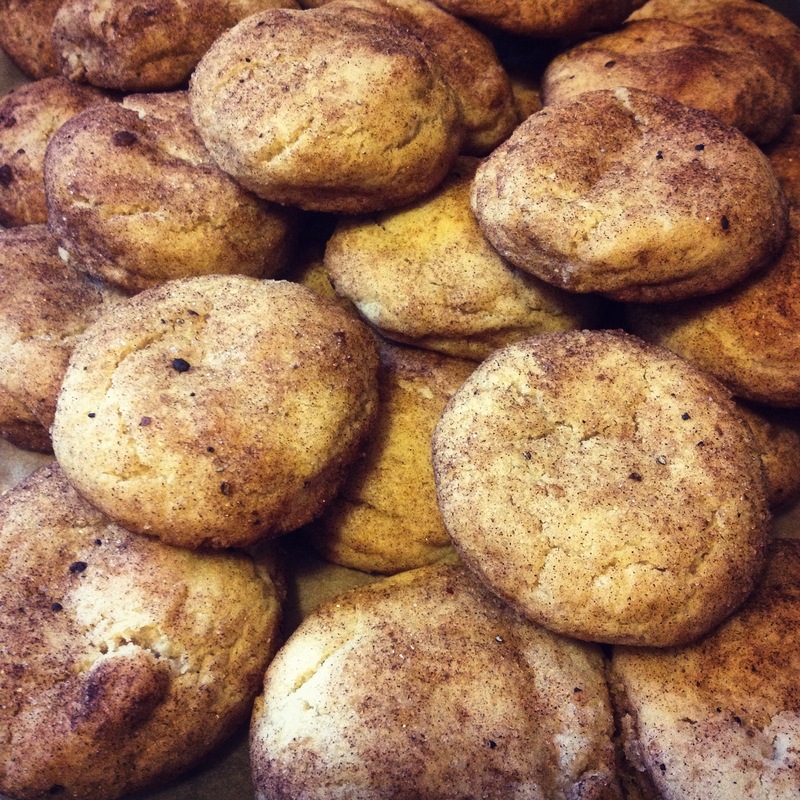 Bake the snickerdoodles for 10 mins., rotating the pans midway through baking to ensure even browning. Remove the pans promptly from the oven and cool on a wire rack for 15-30 mins. Serve warm or at room temperature. Brown butter snickerdoodles will keep in a tightly closed container for up to a week. 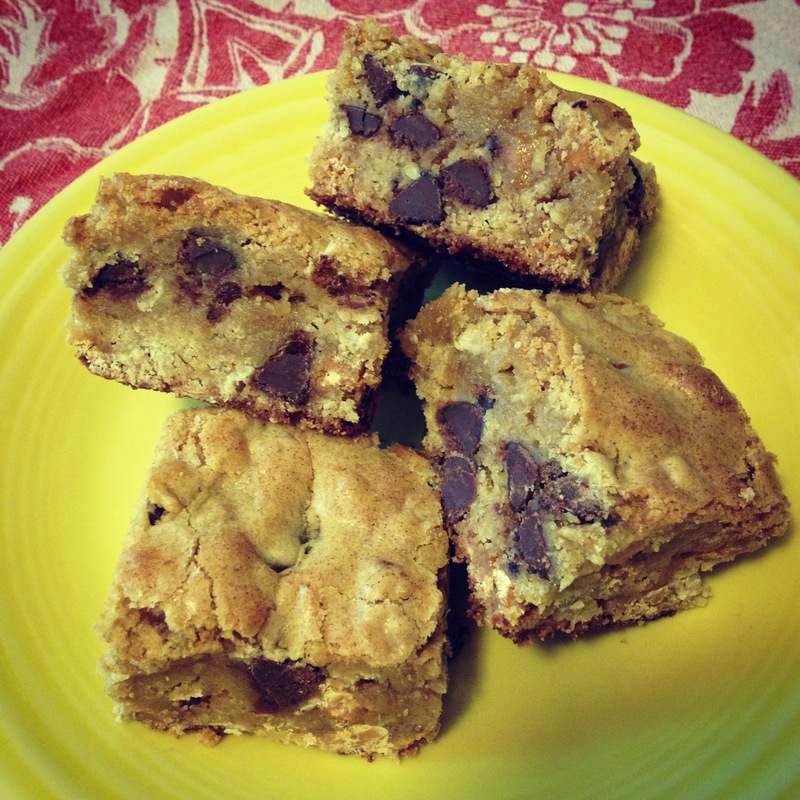 Gooey oatmeal chocolate chip bars, aka “compromise cookies”. Posted by cookcanread in baking, cookies & bars, you can freeze it! 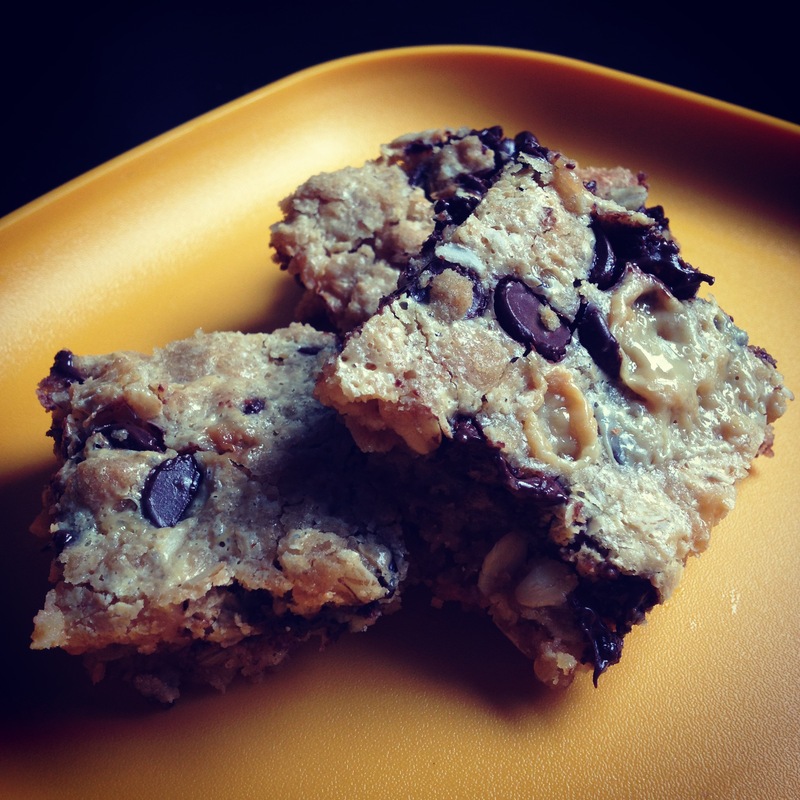 In our house, these oatmeal chocolate chip bars are a camping staple. In fact, I only make them for camping trips, because they’re so dangerously good I am afraid to have them around more often. With a buttery, crispy oatmeal shortbread base and a gooey chocolate-y top that has pockets of caramel-ly goodness (look at me making up adjectives), it’s difficult to stop eating them. Each year, we go camping at least once with our close friends and these are a must-bring item; within the group, they’re known as “compromise cookies”, a blend of oatmeal cookies and chocolate chip bars (so I can bring one universal favorite instead of two batches of treats), and they disappear fast. The container tends to stay on the picnic table the entire time we’re awake, for easy access. By no means are compromise cookies restricted to campfire-side eating. In fact, the recipe is so straightforward, it would be a fantastic one to make with kids on summer break, perfect for your block party or play date. They are quite sweet and rich, so a small square goes a long way; you can get 24-32 bars from a single recipe. They freeze well, and may or may not make an incredible base for a s’more… I wouldn’t know. Preheat the oven to 350 degrees. Lightly grease a 9″ x 13″ baking pan and set aside. To a large bowl (you can use a stand mixer, but this can also be done by hand), add the flour, oatmeal, salt and brown sugar and stir until combined. Mix in the butter until you have a stiff, crumbly batter with an even consistency. Pour 3/4 of the mixture into your baking pan and press down with your hands or the back of a wooden spoon until it’s compact and evenly distributed. Pour the sweetened condensed milk over the top and tilt the pan until it covers the crust evenly. Sprinkle the top with chocolate chips and then crumble the remaining 1/4 of your crust mixture over the top. Bake for 30 mins., until the top is bubbly and lightly browned. Cool completely at room temperature before cutting. The bars will keep in a tightly-covered container at room temperature for 3-6 days and can be frozen in resealable plastic bags or freezer-safe containers for up to 3 months. 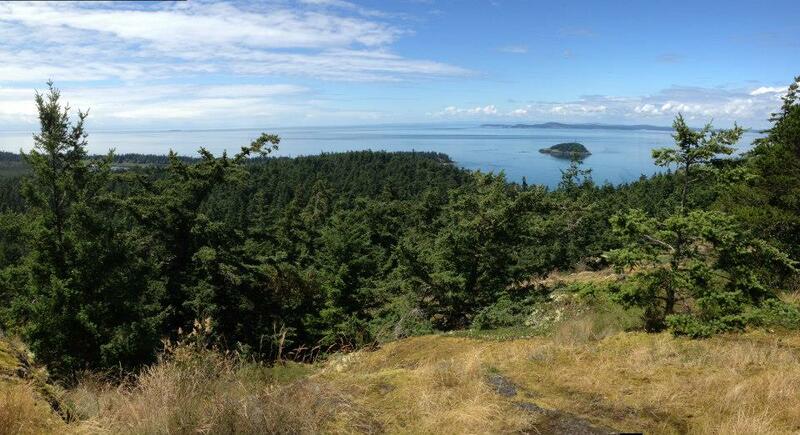 After spending some quality time in each place, we returned to the campsite to refuel with compromise cookies. A buckle is a dessert that demands you invent new adjectives. Is it a pie-y crisp? Or a crisp-esque pan pie? Do you work “cake-y” into the mix? However you choose to describe your buckle, it’s very nice to have both pastry crust and crumb topping involved, and we haven’t even begun to consider the fruit filling. You can buckle with any number of fruits: blueberries, strawberries, apples, peaches, rhubarb, or a mix of fruits like I did. How nice to have different textures, flavors and tartness in each bite. With a lovely pile of rhubarb (I was tempted to stack it like kindling) in the kitchen, I tried a buckle I’ve been thinking about for some time. I wasn’t interested in making a cake, didn’t have quite enough for a proper pie, so it seemed like just the right recipe for me. After a good experience with blueberries some years ago, I had been curious about further buckle experimentation; I adore the name, and hoped the treat resulting from my experiments would be as nice as its moniker. I was not disappointed. Without making it precious, a buckle feels old-fashioned and homey, with its combination of simple pastry crust, bubbling fruit and buttery crumble. It’s easier to make than a pie or cake, but has such interesting elements that it seems fancy. If you have fresh fruit, wonderful– your imagination is the limit for what you put into the filling. 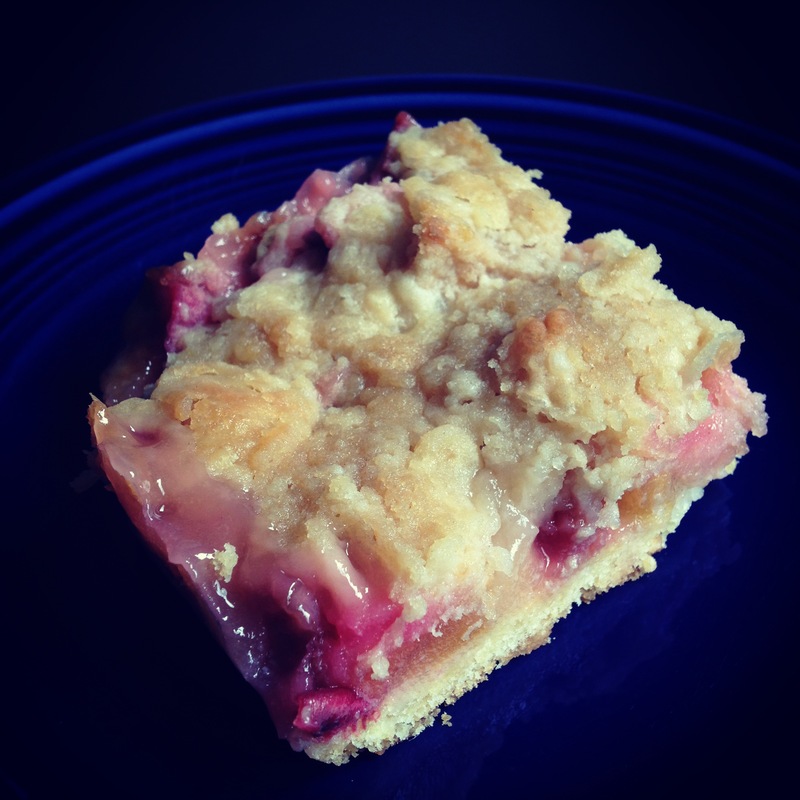 (Most recently, and pictured, I used a sweet-tart mixture of fresh rhubarb and Pink Lady apples; the blend provided complimentary but contrasting flavor and texture.) If you don’t have fresh fruit, consider using that last pint of peaches, plums or apples you put up last summer: I love using my precious pie plums. The golden brown crumble with pretty fruit peeking out, stained glass window-style, is nice to look at– and let’s talk about the taste. If you’re not a fan of butter, this is not the recipe for you. Each bite is first buttery, then sweet-tart from the fruit, then buttery again. You can add ice cream to the mix, but it doesn’t need any. I’ve always been a fan of cobblers (I won’t pass up my opportunity to make one with the first blackberry harvest this year) and have recently gained confidence in my pie-making skills, but for now I am leaning heavily toward a Buckle Summer. It sounds fun and will taste even better, so what’s not to like? 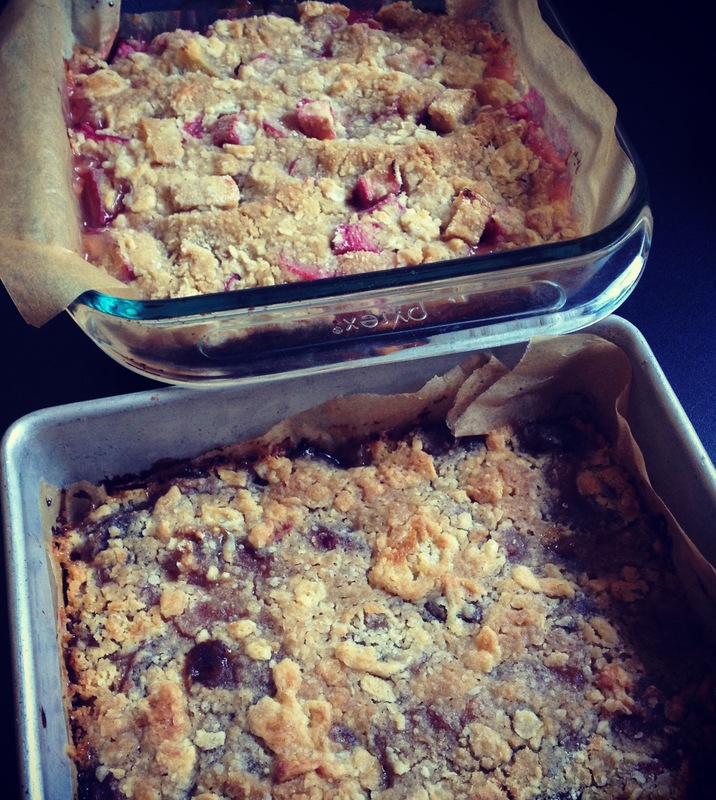 Here are my recipes for both fresh and canned fruit fillings, with crust and crumble enough for TWO 8″ buckles. ‘Cause you will want two. Let us know in the comments what you have used (or plan to use) in your own buckles. Here’s to Buckle Summer! To make the crust, whisk the flour, sugar and salt together in a large bowl. Using a pastry cutter, two forks, two knives or your fingers, work the cold butter (keep it refrigerated, already in pieces, until just before you need it) into the dry ingredients until you have evenly-distributed pea-sized pieces throughout. In a small bowl, whisk together the egg yolks with 3 T. cream and add to the other ingredients. Use your hands to mix until the dough just holds together; add the final 1 T. cream only if necessary, if your dough is too crumbly. Form a ball and wrap in plastic wrap (or a tea towel if you prefer) and refrigerate for at least one hour. To make the crumble, whisk the flour, brown sugar, salt and cinnamon together in a medium bowl; use your fingers or a pastry cutter, etc. to work the butter into the dry ingredients until you have evenly-distributed pea-sized pieces. 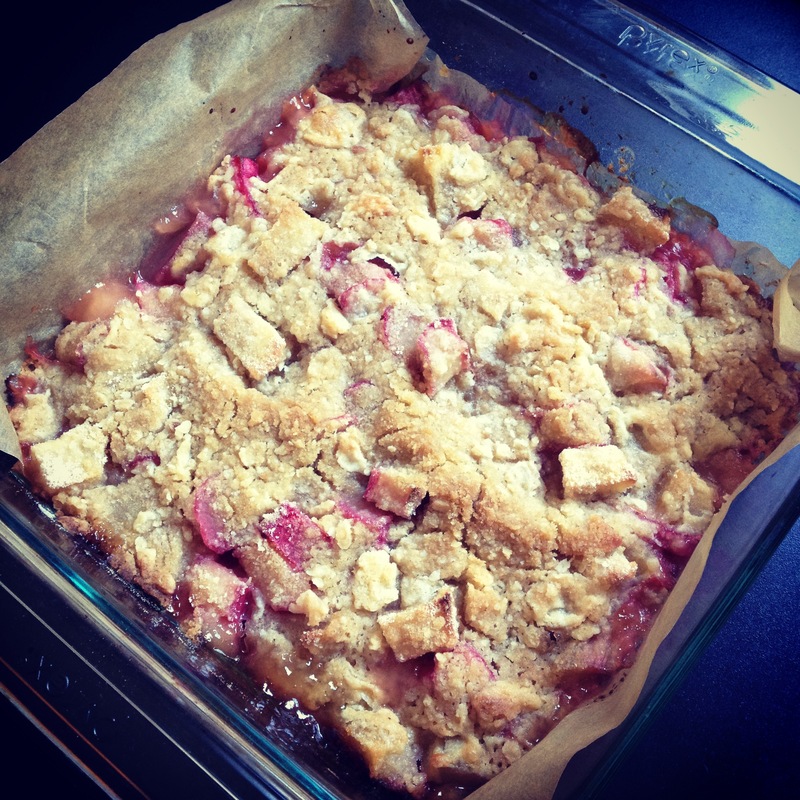 Refrigerate the crumble until you need it. Combine all the ingredients and macerate at room temperature for at least 30 mins., or until crust and crumble are ready. Reserve the syrup for another use, if applicable. I use mine to flavor plain yogurt, or add it to a smoothie. Preheat the oven to 400 degrees. Line TWO 8″ square baking pans with parchment, leaving an overhang on two sides of each pan if you plan to remove the buckles and cut them into squares. Remove the crust from the refrigerator and cut or break it into two equal amounts. Place one half between two pieces of parchment or wax paper and roughly shape it into an 8″ square. You do not need to be precise. (Alternately, you can flatten and shape it with your hands in what I call “pizza in the air” style.) Perfection is not important here; it is a forgiving, malleable dough and you can patch it, as necessary in the pan. Place the crust into the pan and use your fingertips to press it into the corners and out to the edges of the pan evenly. Repeat with the second crust. Spoon your fruit filling over the crust, making sure it covers the crust evenly out to the edges of the pan. If you are working with macerated fresh fruit, scrape any juice and sugar left in the bowl over the fruit. Repeat with the second buckle. Remove the crumble from the refrigerator and divide (you can eyeball, no need for measurement) in half. Sprinkle half over the fruit filling in your first pan, making sure to spread some out to each edge and corner. Use the remaining crumble to top the second buckle. Bake for 35-40 mins. Halfway through, rotate the buckles so they brown and cook evenly. Remove from the oven and cool before serving. Garnish a warm bowl of buckle with ice cream, or cool completely, cut into squares, and eat plain. Notes: Of course, you can make one buckle at a time. Just make a half recipe of crust and crumble and choose one filling. You will need one 8″ square pan and the cooking time will be the same. Or, use a 9″ x 13″ baking pan for a full recipe of crust and crumble and *double* one of the filling recipes (8 c. fruit, etc.). *Some possible fresh fruit combinations: blueberries with peaches; a mix of strawberries, blackberries and raspberries; plums with cherries. Any berry or stone fruit should work beautifully, alone or in combination with another fruit, or two. Just keep the total amount of diced fruit to 4 c. and you should be a-okay! I have been lucky to have a steady stream of local apples coming in my CSA boxes this fall; Honeycrisp, Ginger Gold, Pazazz and Pink Lady varieties all made appearances at one point or another. We quickly realized that the quantity typically on hand was far beyond that comfortably snacked on by two people, so I started cooking and baking. I made my favorite apple crisp and apple jam, a lovely bread pudding and some waffles, even savory chicken and cabbage dishes. (Stay tuned for the braised chicken dish, one of the best meals I have made this fall.) In the course of researching more apple recipes, I kept running into one thing that I really wanted to make: cheesecake with apple topping. It just sounds so good! I couldn’t justify making an entire cheesecake for two people, so I played around with my recipe for cheesecake bars and came up with this version, featuring apple cider caramel sauce and the last of my Honeycrisps. 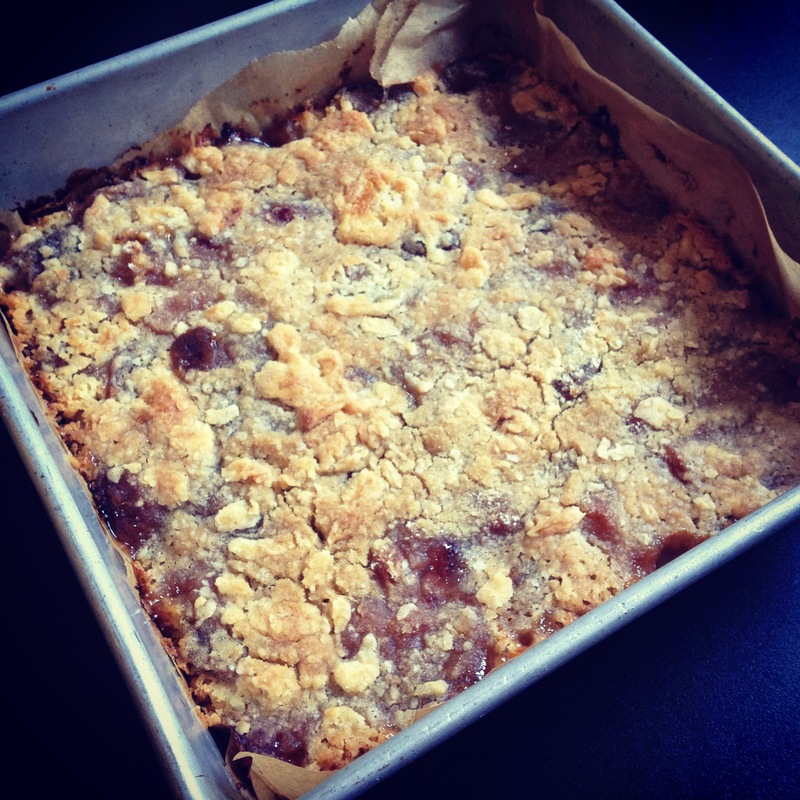 The bars now join the ranks of apple recipes I will look forward to making this time of year. So, let’s talk about the crust for a minute. I have a soft spot for Anna’s brand Swedish cookies, particularly the almond and ginger thins. I had a box of almond thins in the cupboard I bought for an icebox cake idea that never materialized, and no graham crackers in sight– and so the crust for these was made with cookies, and it was delicious. Grahams, store-bought or homemade, would work just as well. As for the caramel, I had apple cider caramel sauce left over from a batch I made to barter, so you could make some of that to use (it’s worth it– the cider flavor in the caramel amplifies the apple flavor of the topping beautifully) or substitute any sauce of your preference. Light or dark, salted or not, cider-based or traditional– it will all work. (If you’re in Seattle, I highly recommend the sea salt caramel sauce from Hot Cakes, which I have seen for sale at Sur La Table and PCC as well as the HC shop in Ballard. It’s stellar stuff.) I guess what I am trying to get at is that these bars are a lovely shortcut to a more complicated dessert (a full cheesecake) and I would hate for them to become tedious for you. They’re supposed to be a treat, not lots of work. Use what you have or what you like to simplify an already simplified recipe. As a treat, they rank pretty high on my list of new favorites. They are sweet but not overly so and a small square goes a long way. 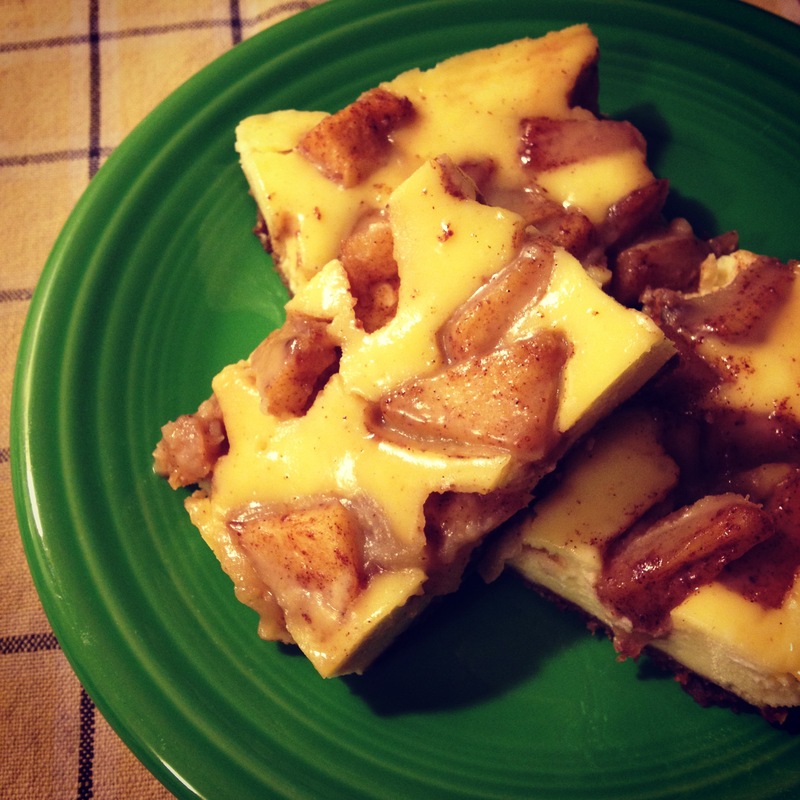 The apple provides some texture and is a nice contrast to the creamy, dreamy cheesecake part. As I mentioned above, the crust and caramel sauce can be adapted to your pantry or preferences, to some degree. And, perhaps most important, they taste very good. If your Thanksgiving meal includes a dessert buffet, as many do, these caramel apple cheesecake bars would be right at home. They turned out just how I wanted and I think you will like them, too. Preheat your oven to 325 degrees. Line an 8″ x 8″ ceramic or Pyrex baking dish with foil and set aside. In a medium bowl, combine the crushed cookies or grahams with 3 T. melted butter; use a fork to mash until the mixture is slightly crumbly but starting to hold together when you press on it. Transfer the crust mixture into the foil-lined pan and use a spoon, your hand or the bottom of a drinking glass to carefully press it into an even layer. It may be necessary to lightly oil the spoon/hand/glass so it does not get coated with the crumbs you want in your crust. Set aside. Make the topping next so it cools while you make the filling. In a small skillet, melt the remaining 1 T. butter over medium heat and add the apples; cook for 7-10 mins. over medium heat until the apples start to soften. Mix in the cinnamon, nutmeg, ginger and pinch of salt and cook for another minute or two. Remember that the apples will soften further in the oven, so you’re not looking for them to be completely “done”. Remove the skillet from the heat and set aside to cool slightly; 10 mins. is sufficient. In another medium bowl, stir together the cream cheese and sugar. Use a whisk to incorporate the eggs, just until combined, and then fold in the vanilla and cinnamon. The mixture will be on the soupy side and should pour fairly easily. Use a spatula, or simply tilt the pan back and forth, to even out your cheesecake layer over the crust and get into the corners. Gently dollop the apples over the top of the cheesecake; they won’t cover completely, so make sure you get some into the edges and across the surface in an even layer. Pour any juice/sauce from the bottom of the skillet over the top. Bake for 25-30 mins., until a toothpick inserted into the cheesecake layer comes out clean and the filling doesn’t jiggle when you rock the pan gently. Cool for 15 mins. If your caramel sauce is not at room temperature at this time, microwave it in 10 second increments or place in a pan of warm water until it can be poured. (Don’t allow it to become molten! You are liable to get burned and sometimes can change the consistency of the caramel with overcooking.) Drizzle the caramel sauce over the still-warm bars and then tilt the pan (which may still be warm, so be careful) gently to spread the caramel. Allow the cheesecake bars to cool to room temperature; once at room temperature, cover with plastic wrap or tin foil and chill thoroughly in the refrigerator, for at least 2 hours. The caramel sauce will seep into the filling around the apples; this is why it’s not necessary to sweeten the apples in the skillet. Your bars can be served as-is or with a small extra drizzle of caramel sauce. Enjoy! *This is fairly forgiving, plus or minus about a half cup. Don’t sweat over a small amount of extra crumbs, or a few short. You can also use homemade grahams. Sometimes cookies cause indecisiveness. For a baker, it’s which one do I make? Should I use raisins or chocolate chips, make drop cookies or rolled…? For consumers, it’s which one do I choose? How can I make a decision between a delicious oatmeal raisin cookie or an equally yummy chocolate chip? Cookie parties and cookie trays are not meant to cause anxiety, but the truth is that folks love a good cookie and, at the same time, hate to say no to a good cookie. In order to ease your mind, gentle reader, and decision-making process, I am sharing this recipe for Kitchen Sink Cookies. They have almost every classic cookie represented, and represented well. So, what’s in a Kitchen Sink cookie? Peanut butter, oatmeal raisin and chocolate chip cookies are all accounted for, in a perfectly balanced way. The peanut butter cookie is the hardest to pick out, since the texture of a good pb cookie is quite distinct, but you get the gooey chocolate of a classic chocolate chip cookie and the gently spiced chewiness of a well-made oatmeal cookie. Each bite is satisfying: maybe you get a bite with raisin and are reminded of drinking cocoa with your great-grandmother, as I was, or get a crisp edge that tastes just like the peanut butter cookies your mom makes for your dad. Kitchen Sink cookies satisfy a whole range of cravings. The recipe is originally Dorie Greenspan’s, from Baking: From My Home to Yours. (My changes are minor: I add dried fruit, most often raisins, because I like the texture, and I use slightly less cinnamon and chocolate.) If you don’t own this cookbook, consider adding it to your home library because it is marvelous. The recipes are at once approachable and special, the writing is clear and concise and the cakes, cookies and other goodies within are awe-inspiring. Included is everything from celebration cakes to muffins to cookies like these. It is a great asset to my own library; I haven’t made anything I didn’t like from Baking. 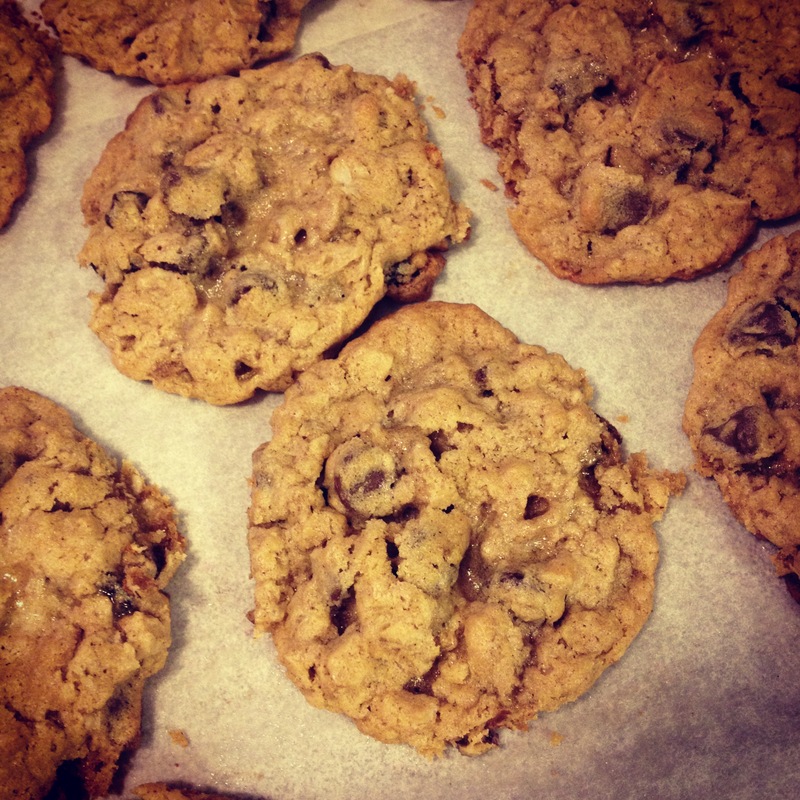 What else would you add to your Kitchen Sink Cookies? In a small bowl, combine the oats, flour, baking soda, cinnamon & nutmeg. Gently whisk together. Using your stand or hand mixer, cream the butter, peanut butter and sugars together until light and fluffy, at least 5 mins. Add the egg and mix until well-incorporated, then mix in the vanilla. Add the dry ingredients and mix on a low speed just until combined. Fold in the chocolate chips and raisins or cherries. Cover the bowl with plastic wrap or a plate and refrigerate the dough for at least one hour. When the dough is thoroughly chilled, preheat your oven to 350 degrees; cover two cookie sheets with parchment paper, or grease them lightly. Drop the cookies by teaspoonful (a melon ball-sized scoop works well and ensures uniform baking times) onto your pans and bake each pan for 13-15 mins. until golden brown. Rotate the tray after 7 mins. to ensure even baking. Cool before serving; nothing kills a cookie craving like a molten chocolate burn to your tongue. These cookies can be frozen for up to three months with good results, in a large Ziploc bag or tightly-sealed container. *Dorie uses crunchy and I use creamy. You choose either or a mix of both, so long as you’re using a kind that doesn’t need to have the oil stirred into the nut butter every time, as some of the natural brands do. I call the no-need-to-stir kinds “homogenized”. One of my favorite days of the year is the Saturday in December when I host a cookie swap. I love gathering some of my favorite ladies for a few hours of chatting, showing off my Christmas tree and decorations with holiday music going, and it’s pretty fun to be able to send everyone home laden with homemade cookies. (Even when they’ve done much of the work.) I ask each guest to bring two dozen each of two kinds of cookies and an empty container to fill up with cookies to take home. I say it every single year– my friends can bake! I love seeing the variety of treats brought to the party; there’s almost never a duplicate on the table and you see everything from treasured family recipes to fancy experiments. This year’s table included java cookies, snickerdoodles, hot cocoa cookies, zimsterne, applesauce cookies and more. There were vanilla cupcakes and pumpkin gingerbread, too. Everything I sampled was delicious! I am so lucky to have such wonderful friends to share the afternoon with me. In addition to my party, I participated for the first time in The Great Food Blogger Cookie Swap. I was matched with three other bloggers, Secret Santa-style, and sent them each one dozen of my new favorite recipe, stuffed cookies, which I learned about this summer from my friend Charlene. They are dark and fudgy on the outside, gooey and sticky inside from the caramel candies “stuffed” into the dough. Sometimes called Rolo cookies, this new name comes courtesy of my Mom, who also got the recipe from Char and has been experimenting with different candy fillings. So far she has had success with peanut butter cups in place of the caramel candies and plans to experiment this week with cordial cherries. YUM! Three bloggers drew my name and sent me fun boxes to open, and I have to say there’s not much better than receiving a box of surprise homemade cookies. Even though I knew to expect three boxes, I didn’t know who they were from or what was inside until I got each one. I first received some Peppermint Crunch Dark Chocolate Chip Cookies from Stephanie at Munch I Munch— I’m a sucker for chocolate and mint and these didn’t disappoint! Using a chocolate chip cookie base rather than a chocolate base was perfect, helping to highlight the mint flavor, which tends to be hidden by chocolate in other sweets. My next box came from Laura at Ring Finger Tan Line and contained delicious salted caramel-filled chocolate cookies. These were so good! I loved the salted caramel, similar to the filling in my own cookies but with a distinct, sophisticated twist. My third box came from Toni at A Taste of Alaska, all the way up in Fairbanks. (I couldn’t help but wonder if she’s a neighbor of my niece.) Chewy, delicately spiced and yummy, I’ll have to wait until I see her post for the exact name of her cookies, but they taste to me like a mix of oatmeal, pumpkin and chocolate chip and they’re lovely. A perfect accompaniment to a cup of tea. Thanks to all three ladies for my treats! I hope to be able to participate in the Cookie Swap again; I had so much fun this year. In the bowl of a stand mixer, cream together the butter and both sugars until light and fluffy. Add in the eggs, one at a time, and then the vanilla. In a separate bowl, sift together the flour, baking soda, salt and cocoa. Add the dry ingredients to the butter mixture and mix until well-combined. Cover the bowl with a plate or plastic wrap and transfer to the fridge to chill, at least an hour. The dough is very difficult to work with at room temperature, but becomes almost like modeling clay when cold, which will be very helpful for stuffing them. When you are ready to assemble and bake the cookies, preheat the oven to 350 degrees and unwrap all your candy, if you haven’t done so already. Plan for 48-60 cookies from this much dough, depending on the size of your scoop. Line baking sheets with parchment or silicone mats. 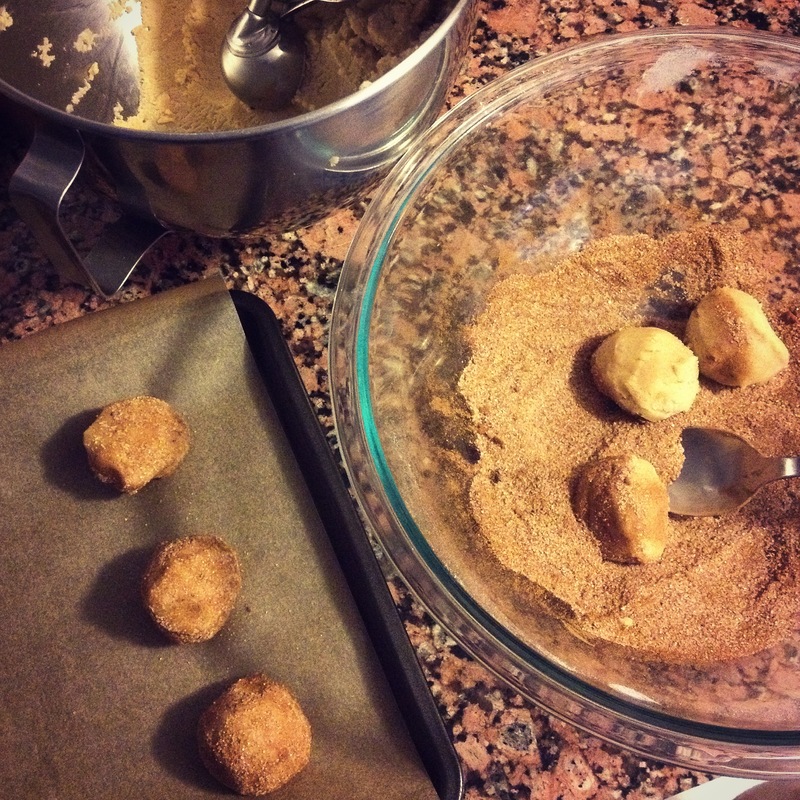 Use a teaspoon or small cookie scoop (my preference) to get a ball of cookie dough. Press the candy into the top of the ball and mold the dough up and around the candy until it’s completely enclosed; continue to do so until all dough is used up. Pause to chill the dough if it becomes too sticky or soft to work with. Bake the cookies for 8-10 mins. ; remove from the oven and immediately slide the parchment or silicone off the sheet onto a clear counter space. Use the back of a spatula to tap the top of each cookie flat; just a light whack will do. This gives the top a nice texture and seems to help distribute the filling evenly. Allow the cookies to cool completely before eating– the centers are molten! Stuffed cookies keep in a tightly-sealed container for about a week.